Featuring one of the most popular vintage designs of all-time, 1963 Topps Baseball utilizes bright colors and crisp images. 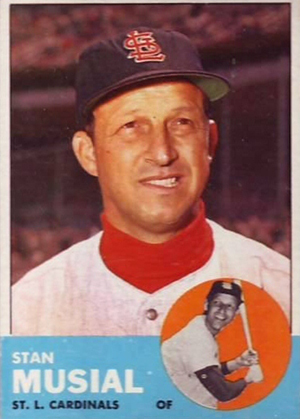 In addition to Pete Rose's much-heralded rookie card, the set also features the rookie card for Willie Stargell and Stan Musial's final standard-issue card. Despite a new level of competition from Fleer in 1963, Topps continued to dominate the baseball card market in a big way. Many vintage collectors believe that '63 Topps is one of the best baseball card sets ever produced. The design was created using 1953 Topps Baseball as the framework and adds impressive photography and sharp colors. 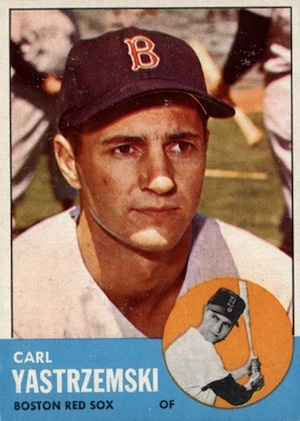 Shop for 1963 Topps Baseball cards on eBay. 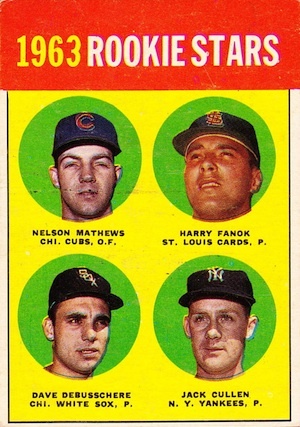 Coming in slightly smaller than the previous year, the 1963 Topps Baseball base set includes of a total of 576 cards. 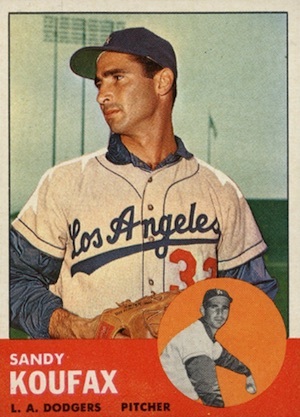 The card bottoms feature colored panels that contain the player's name, position, and team, while extending all the way to the bottom of the card. Because of this, the bottom card corners show damage very easily, making it especially difficult to find these cards in high-grade condition. Base cards also feature a small black-and white image within a colored, circular background. The backs of the 1963 Topps Baseball cards are equally impressive, showcasing comprehensive career and season-by-season statistics. Not only are they informative, but they look great as well, thanks in part to the use of yellow/gold ink and the contrasting black font and white background. 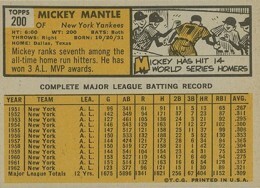 Accompanying the biographical and statistical information is one of Topps' classic cartoons providing a whimsical blurb about the depicted player. 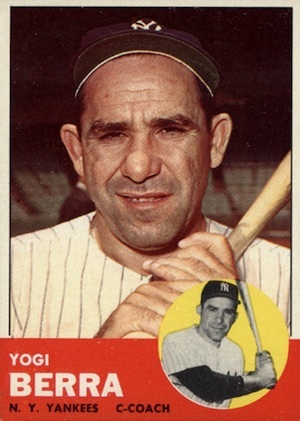 As was the case in previous products, the 1963 Topps Baseball set was released over seven series. Again, several different specialty subsets are available. 1962 League Leaders (#1-10) kick off the entire set with references to the top performers from the previous year. World Series Highlights (#142-148) cover the 1962 World Series between the New York Yankees and San Francisco Giants. The 1963 Topps Baseball set also includes many compelling multi-player combination cards. 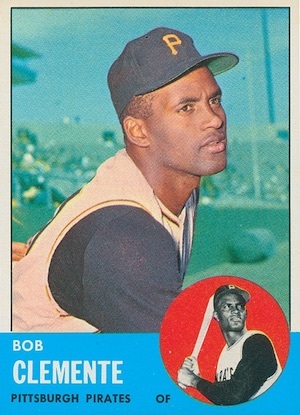 Most notable, Bombers' Best (#173 - Mickey Mantle) and Buc Blasters (#18 - Roberto Clemente) remain in demand thanks to the primary star player on each card. 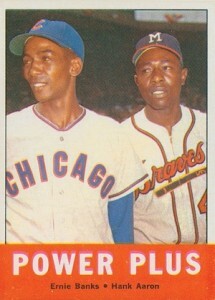 Power Plus (#242) pairs Hall of Fame icons Ernie Banks and Hank Aaron, while Pride of N.L. 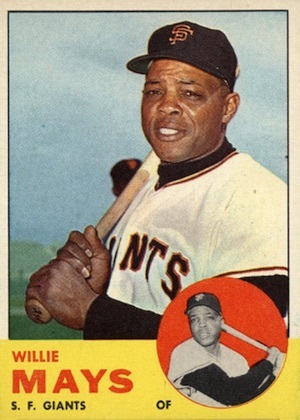 (#138) features Willie Mays and Stan Musial. Among some of the most popular options, Rookies Stars are randomly scattered throughout the checklist and feature a noticeably different design than the main base set. Multiple floating heads greet collectors with a colored, circular background for each player. The Rookie Stars subset includes the rookie cards for Pete Rose and Willie Stargell, among other notable options. Additionally, various manager, team and checklist cards are also included among the subset options. While the key names carry the 1963 Topps Baseball release, Series 6 (#447-522) and the high-number Series 7 (#523-576) issues are the rarest and most highly sought-after portions of the set. As several of the top stars appear in the these series, even those in lesser condition carry a premium due to scarcity and it can be a challenge to locate them in high-grade condition. 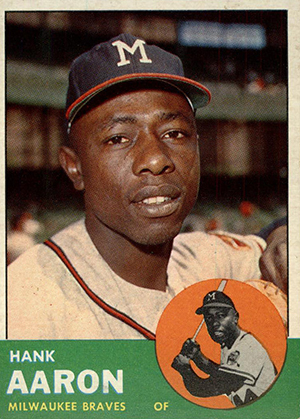 Relatively free of errors, there are a few variations in 1963 Topps Baseball. However, none of the cards really see any added significance or value. 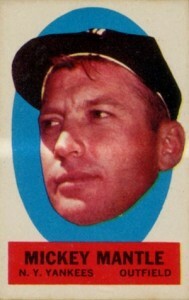 Art Fowler (#454) can be found with either an orange or white background with the number on the card's back. 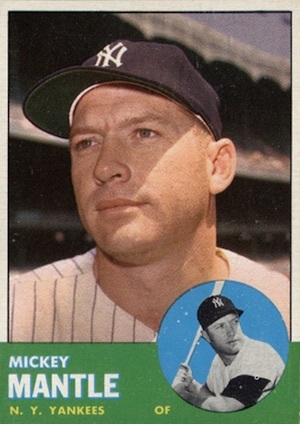 Two of the Rookie Stars cards (#29,54) feature either 1962 and 1963 on the front. Three checklists (#102, 431, 509) have small differences. Also, cards #371-446 feature several subtle variations that mostly deal with cropping or image positioning. Although not a rampant issue, collectors should be aware that counterfeits of the Pete Rose rookie card do exist. The fakes generally feature thinner card stock to the point that they are nearly transparent when viewed against a light source. Counterfeits also have an added black outline around Rose's baseball cap. 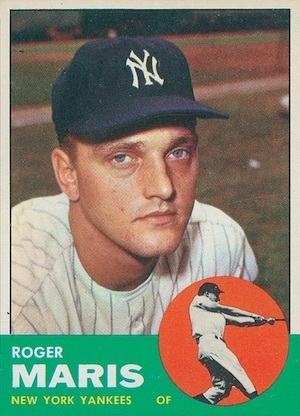 There is also an intriguing card subject in 1963 Topps Baseball that is likely more familiar to basketball fans. Best remembered for his Hall of Fame NBA career with the Detroit Pistons and New York Knicks, Dave DeBusschere spent several seasons as a pitcher for the Chicago White Sox. His baseball rookie card (#54) predates his basketball rookie by several years. 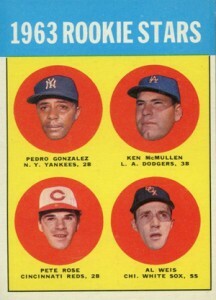 Collectors are treated to one insert in 1963 Topps Baseball. Basically stickers, Peel-Offs can be found in each wax pack. The 1-1/4" by 2-3/4" inserts feature a floating-head image with a colorful background and nameplate. The Peel-Offs are available with blank backs or with usage instructions. Because most were applied to a surface or discarded, high-grade examples actually carry good value. 576 cards. Shop for base sets on eBay. 46 cards. 1 per wax pack. Peel-offs are not numbered and are listed in alphabetical order by last name. 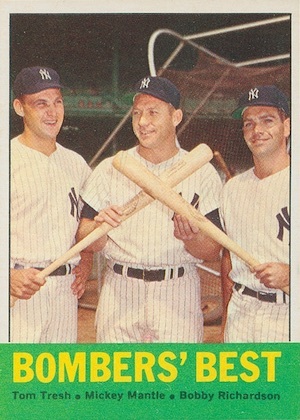 1963 Topps 144 Maris Sparks Yankee Rally (World Series). PSA 8 NMMT. (TX3770TT). Several of the names on this list that begin with ‘Sa’ have been borked. #252	Ronnto? The description said it perfectly: The 1963 Topps set is lauded as one of the best sets in baseball card history. …and quality cards within this set only seem to be harder and harder to come by year after year. The only reason I did not give this set a 5 star rating: When I collected it in 1963, the first series had a large number of cards with the “lint’ effect-floating white specs that appeared in the printing process. This was corrected in later series. 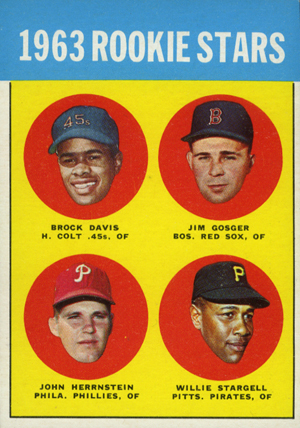 The 1963 Topps set is a classic set, one of the best sets ever produced by Topps. It is very difficult set to complete, with cards from the 2 last series (#447-576 very tough to find. Fortunately, I completed the 1963 set sometime in the late 1980’s, and it was a very challenging set to complete even then, at a time when old baseball cards were a lot cheaper back then.